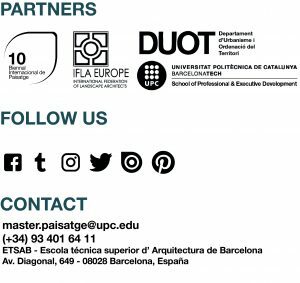 GREEN INFRASTRUCTURE – Goal: Pla de Reixac – Master in Landscape Architecture Barcelona – Universitat Politècnica de Catalunya – 35ª EDITION. The workshop of Green Systems II has been started the last tuesday 8th of january. It is given by Manuel Ruisánchez, Xavier Mayor, Anna Bonet, Agata Buscemi and Marcel Complido. The topic of this workshop is GREEN INFRASTRUCTURE: making landscapes, making ecosystems. The students visited the site for more than five hours, guided by the assistant professors of the module. Once there, they made exercises in situ to recognize plant species and collected informations about the use of the territory nowadays: rain fed cultivation combined with model aeroplane fields and military areas now in disuse. Green Infrastructure is a theme to develop the landscape architecture project. The students will study the territory through its green infrastructures, they will know their structures and the ecosystem services that contribute to reach the project of landscape architecture. Nowadays, fragmentation causes the loss of habitats and biodiversity, and the production/extraction of materials have already been stretched the ecosystem resources to the limit. Faced with gray infrastructure, Green Infrastructure offers multiple environmental, social and economic benefits. The European Union’s Strategy 2011 on Biodiversity points to the 2020 goal of improving ecosystems and ecosystem services through the creation of green infrastructure. Green Infrastructure has been defined by the European Commission as a: “network of natural and semi-natural areas and other environmental elements, strategically planned, designed and managed to provide a wide range of ecosystem services “. This paradigm requires a landscape architecture project which be able to identify these green infrastructures in the territory and review their situation and future potential, and proposing interventions to establish, consolidate and improve the green infrastructure. Pla de Reixac is located in Plana del Vallés: at the border with the Catalan pre-coastal depression in the south, and with the confluence of the Ripoll and Besós rivers in the north, which constitute the most important fluvial connectors in this area. It has an approximated area of ​​500 ha, is composed of agricultural crops and bushes, and presents an undulating and mainly flat terrain with a level difference between the highest and lowest point around 80 meters. From north to south three torrents intermittently flow through the area. Two of them are born in the same plain (torrent of the Mas Durant and torrent of Can Rocamora), and the third, the largest (La Riera Seca), flows in the river Besós. Due to this fact, the Pla de Reixac constitutes the recreational free space for the inhabitants of these surrounding urban areas. It should establish the sequence of actions to be developed, its evaluation in terms of improving the systems and their results in place, as well as considering their evolution over time. This area has suffered a big urban pressure during the past years as it is one of the few pieces of large dimensions not protected by urban legislation that are within the Metropolitan Area of ​​Barcelona. Therefore, Green Infrastructure project in Pla de Reixac must articulate a proposal planned in time, that can give an answer to the conflicts that exist in the area. He project should enhance its values ​​in order to feed ecosystem services to the populations that surround it, and finally, to become the strategic connector of the territory.